Our 24-Seater Mini Coach Hire package in York is designed to transfer small sports teams, school parties or church groups comfortably, conveniently and seamlessly across York. Whether it’s a simple hen do drop-off or a week-long expedition, our mini coaches will make travelling in a larger group easier for the organizer and more pleasant for the passengers. Complete with ergonomic seats, the 24-Seater Mini Coach comes in just the right size for small gatherings or school groups. Hire it for a day, with or without a chauffeur, and take all the fuss out of moving children and adults from one tourist attraction to the next. 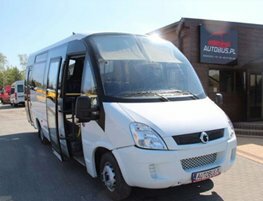 Fully equipped for a cosy and relaxing journey, this vehicle ensures complete relaxation for longer periods. Not a day over 6, the mini-coach you’ll be booking will be kitted with all the trimmings, poised to provide people of all ages and abilities with the comfort and luxuries they expect. The ergonomic and space-saving design of your mini coach will ensure that there’s ample legroom and that everyone’s comfortably seated throughout the journey, however long it may be. The 24-Seater Mini Coach Hire package is a powerful, spacious and reliable vehicle that helps you make the most of your time, seeing as much of York as possible. To book your 24-Seater Mini Coach, ask for an updated price quote or to speak to a polite member of the York Minibus team, please feel free to write or call at your earliest convenience. We may be able to provide you a vehicle in under 30 minutes, but we also offer early booking discounts, so don’t wait!